A derivative work by Judson Wilson, 5/27/2014. Adapted from the CVX example of the same name, by Almir Mutapcic, 2/2/2006. where the variable \(H\) is the frequency response function, corresponding to an impulse response \(h\). # Number of FIR coefficients (including the zeroth one). 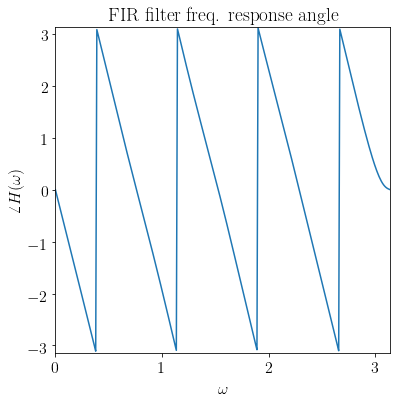 # Rule-of-thumb frequency discretization (Cheney's Approx. Theory book). # Construct the desired filter. D = 8.25                # Delay value. Hdes = np.exp(-1j*D*w)  # Desired frequency response. # problem must be formatted into a real-valued representation. # Split Hdes into a real part, and an imaginary part. # Split A into a real part, and an imaginary part. 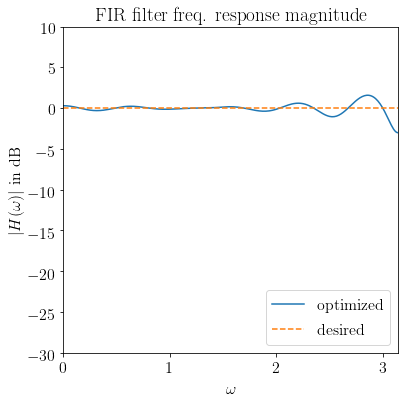 # Optimal Chebyshev filter formulation. # h is the (real) FIR coefficient vector, which we are solving for. # such that all computation is done in real quantities only. cp.max(  cp.square(A_R * h - Hdes_r)     # Real part. + cp.square(A_I * h - Hdes_i) ) ) # Imaginary part. # Check if problem was successfully solved. 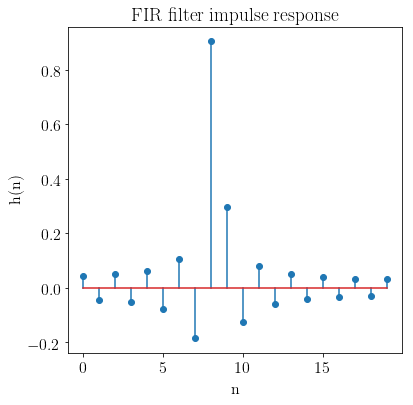 # Plot the FIR impulse reponse. # Plot the frequency response.